The exercises I have selected are from my own teaching and many of the prominent music theater singing teachers of our day: Mary Saunders-Barton, Robert Edwin, Jeannette LoVetri, Elisabeth Howard, and others. Of course, learning to sing from a book or a website is not ideal, but it can be a great resource to get you started. For the more experienced singer, it can help you review and perhaps augment what you have previously learned. Most music theater singing is an extension of your speaking voice. Many of the exercises are based on a speech approach to singing resulting in vocal production that is quite different from classical production, but does not exclude classical voice production. For example, Kelli O’Hara used a classical model in the 2013 production of Carousel at Lincoln Center. The other ways music theater singing differs from classical singing is listed on page sixty-six in my book, and credited to master teacher Jeannette LoVetri. They are repeated here. Remember, your throat should never hurt. Your goal is to create a functionally free voice. Most of the exercises I recommend will be sung using the following scale patterns. Feel free to apply scales of your own in addition to the ones I’ll be using. Experiment and have fun! Always begin in a comfortable part of your singing range rather than the extremes of range. If any exercise feels uncomfortable, try the exercise at a lower pitch level first, and then gradually increase the pitch level. First things first! Before beginning to sing, take three to five minutes to perform some of your favorite stretches to acclimate, warm up, and free your body for singing. Here are a few of my favorites. Exercise 1. Roll your neck in gentle circles in each direction. Exercise 2. Rotate your head side to side, looking over each shoulder. Exercise 3. Bend your head forward and place your right hand on the back of your head. Gently use your right hand to push your head into a slightly deeper stretch. You will feel the stretch all the way down your back. Exercise 4. Lift your shoulders up and down towards your ears several times. Exercise 5. Roll your shoulders forward and backwards several times. Exercise 6. Bend forward at the waist and let your entire body stretch toward the floor. Hold the stretch for at least ten to fifteen seconds and slowly return to a standing position. Remain standing to practice. You can sit and sing well, but it’s best to first learn voice technique in a standing position. When sitting, you need to be sure your torso remains in the same posture as standing. Keep in mind, music theater singers are required to move and dance. In my book I explain breathing technique for dancers, but it bears repeating here. Music theater actor, teacher, dancer, and director, Donna Scheer, describes breathing for dance as follows. Music theater singers need to maintain their lower core muscle support while dancing and simultaneously release the muscles in the midriff, waist, and lower back for singing. Scheer adds that postures change depending on the style of dance. For example, jazz dance posture is different than ballet posture. These adjustments need to be taken into account while singing to ensure that the support muscles are accessible (Donna Scheer, personal communication, March 10, 2013). Once your technique is strong, movement can be accomplished without interfering with voice technique. What you do to your body affects your singing. How you stand and how you breathe impacts how you sing. Assume a standing position, and we’ll review correct singing posture from the ground up. Feet – keep your weight evenly distributed on both feet and place them a few inches a part. Knees – relaxed, not locked. Arms – resting at your sides. Torso – keep your shoulders relaxed back but not rigid or forced too far back. Be certain that your shoulders don’t curve inward either. The inward position can interfere with the breathing and support/breath balancing needed for healthy singing. Head – your head needs to be balanced on top of your torso and neck. Some music theater singers lift their chin slightly when belting. This aids in the higher position of the larynx that some singers use in belt singing. There are many common terms used by singers and voice teachers to describe and teach breathing: air flow, appoggio, breath control, breath support, breath management, and singing on the breath. Your goal is to provide the air supply needed to create optimal phonation for singing. Breath allows the vocal folds to vibrate and creates and maintains your singing sound. Breathing for singing (inhalation or how you take in air) is different than breathing for speech. Review the differences between breathing for singing and breathing for speech that are listed below. I’ll explain breath “support” or “balance” later in more detail. But, in short, support or balance is what you do with the air once it is inhaled. Breathing and support/balance are different! Breathing is how you take in air, and support/balance is what you do with that air once it is in your body. Breathing becomes a conscious act. When you start to sing, you think about your breathing. You inhale more air but not to the point of tension. Because you inhale more air, your lungs are fuller. The fullness creates an expansion in your lower body from the ribs to the lower abdomen. This varies person to person (see the five places to breathe explanation below). The exhale is controlled. What this means is that the expansion created in your lower body doesn’t collapse when you begin singing. Like a slow hiss, the air is released slowly and evenly. New findings show that some singers feel an outward expansion while releasing air and others use a very slow inward movement of the lower body while releasing air. Experiment and find which way works best for your instrument. Breathing is unconscious. You don’t usually remind yourself to breathe in every day speech. You inhale small amounts of air. The smaller amounts of air you breathe results in clavicular breathing (high breathing) which works just fine for speech. The exhale is not controlled. We take lots of breaths in every day speech. Everyone experiences breathing for singing in similar and different ways. This exercise helps you find and understand what works best for you. I call this exercise the “five places to breathe.” The five areas are the ribs, waist, midriff, lower abdominals (core), and lower back. First, however, it is important to point out that the ribs always expand and stay expanded for the duration of the exhale when singing, only relaxing back at the end of phrases. The other four areas of the lower body that can expand while inhaling (waist, midriff, lower abdominals, lower back) vary from singer to singer. All combinations are correct and successful. So, how do you know what works best for you? The following exercise will show you. Stand up and place your hands on your rib cage. Take a deep, full breath and make sure your ribs expand during inhalation. Keep the ribs expanded as long as possible while exhaling. Make sure you don’t lift your upper chest and shoulders when you inhale. They should remain as still as possible when you take a singing breath. Place your hands on your waist. Take a deep, full breath and notice if there is any expansion around your waist. Remember, there is no right or wrong at this point. Take several more deep, full breaths and notice if and how much you expand at your waist. Place your hands flat on your midriff. Take a deep, full breath and notice if there is any expansion around your midriff. Remember, there is no right or wrong at this point. Take several more deep, full breaths and notice if you expand at your midriff. Place your hands flat on your lower abdominals (below your waistline). Take a deep, full breath and notice if there is any expansion around your lower abdominals. Remember, there is no right or wrong at this point. Take several more deep, full breaths and notice if you expand at your abdominals. If you are singing AND dancing, releasing the lower abdominal or core muscles should be avoided since they are needed for your dancing technique. Place your hands on your waist BUT place your thumbs forward and the other fingers facing toward your back. The other four fingers will be resting/placed on your lower back. Take a deep, full breath and notice if there is any expansion at your lower back. Remember, there is no right or wrong at this point. Take several more deep, full breaths and notice if your lower back expands. At this point, ask yourself if it was easier to feel expansion at your waist, midriff, lower abdominals, or lower back. Choose the area that was easiest for you to feel expanded. That area combined with rib expansion is where you experience breathing for singing. Those are your “sweet spots” so to speak. When you practice singing breathing, focus on expanding your ribs and the other area (waist, midriff, lower abdominals/core, lower back) that was the easiest for you to feel expansion. After taking a deep, full breath keep those two areas expanded while exhaling to create “support” or “balance” when singing. Exercise 6. Sit on the edge of a chair and lean over at your waist. Let your head and upper body drop between your legs. Relax your neck. Take a deep breath. You will, without consciously trying, feel your breath low and deep. Your lower back will expand. Take several breaths in this position and notice how this happens. When you sit or stand up, maintain the same breathing pattern. Exercise 7. Lie down on your back. Relax your entire body and close your eyes. Keep your arms resting comfortably at your sides. Notice your breathing. It will be low without any effort on your part. Now, notice how you are breathing this way. Get in touch with that automatic response. Take several breaths while you are lying down. Stand up and see if you can maintain the low breathing technique. Breath support or balance is the technique used to exhale air while singing. The singing exhale is controlled and lasts longer than when you exhale for speech. A controlled exhale is smooth and easy. These exercises will help you develop a strong and evenly controlled exhale of air to support or balance your singing. Additionally, achieving support or balance is tricky because the air you breathe in creates air pressure in the lungs, and the amount of pressure changes as air is expelled. Right after you take a breath, your lungs are full. At this point, the respiratory muscles often create more air pressure than needed for optimal singing. Most often a singers uses the inspiratory muscles to resist the outflow of air, but as the amount of air is lessened, an increase in expiratory effort is needed to maintain appropriate air low and pressure. Develop an awareness of these dynamics and experiment to find what works best for your body. Exercise 1. Hiss Exhale. Take a comfortable, rib-expanded, low breath and hiss the exhale on a soft gentle “sh” sound. Notice that your ribs and “sweet spot” resist the outflow of air. Those areas do not collapse when you start to exhale or sing. The stream of air you exhale should sound smooth and even. Be sure to check that your upper body doesn’t turn in or collapse as you exhale. Repeat this exercise several times. With regular practice, over time the exhale will become easier and last longer. Exercise 2. Counting Hiss. Next, replace the hiss with counting numbers out loud. See how far you can count. Vary the pitch of your speaking voice, too. Exercise 3. Staccato Hiss. Place your hands on your waist and hiss three times on “sh” at a quick, staccato speed. You should feel movement around your waist, midriff, and/or lower abdominal/core. Repeat several times and get in touch with the feeling of support or balance you feel while performing this exercise. Exercise 4. Lip trill/buzz. Now you are ready to engage your singing voice with your breathing and support/balance. Take a singing breath and blow the air out through your puckered lips on any comfortable pitch. See how long you can keep your lips moving. Your lips will only move if your air and support/balance are engaged. It’s a great way to determine if your breathing and support are working to create your singing voice. Notice how your lower body engages while you blow out air while buzzing your lips. Exercise 5. Lip trill/buzz on pitch. Choose a comfortable pitch and lip buzz/trill on that pitch. Continue up and down the scale by half steps in the comfortable part of your singing range. Exercise 6. Lip trill/buzz arpeggios. Begin on middle C (C4) and use the basic scale called the octave arpeggio. Continue to move up the scale by half steps. Sing this exercise as high and low as possible. 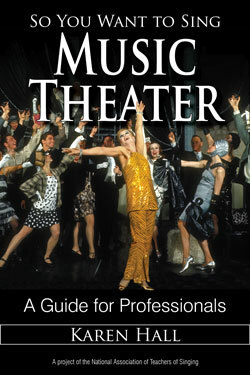 Music theater singers most often use a tone quality that is similar to and based on their speaking voice. If you have had any type of classical singing training, you know that speech based singing is not, for the most part, used in that genre. The next sets of exercises are designed to help you engage your singing to your speaking voice. Your vocal folds are the source of your singing voice and are sometimes called vocal cords. Your vocal folds are found inside your larynx (“the voice box”) and their movement is called oscillation. When you take a breath, they open into a “V” shape and open and close at very high and varying rates of speed to create pitch. The lower and louder you sing, the shorter and thicker your vocal folds. The higher and softer you sing, the longer and thinner your vocal folds become. Your vocal folds interact with the shape of your vocal tract to create varying timbres (colors) and various registrations, also called vocal tract resonance. The actions of the vocal folds and the vocal tract are interdependent. Rarely does either create singing independently. Resonance describes the location of how and where your singing is amplified and reinforced. An open space with boundaries creates resonance. The vocal tract is a flexible, open space resonator in contrast to a fixed resonator open space found inside a violin. There are many terms used by voice teachers and singers to describe resonance: vocal tract, chest, head, sinus (nasal) resonance, mask resonance, etc. Resonance creates vibrations that are often mistaken for true singing resonance. The actual vibrations your voice creates vibrate in your vocal tract. Any other vibrations you may feel are a result or secondary to the vibrations created in your vocal tract. Registration is created by the interaction of phonation (vocal folds) and resonance shape (vocal tract). It is important to understand the individual and independent function of vocal fold vibration and vocal tract resonance. Other terms used to describe female registration are chest, middle or mixed, and head registration. Male registration is often described as chest, head, and falsetto. Other registration terms include belt, mix/belt, fry, and whistle. The use of chest register (Mode 1) and head register (Mode 2) is the defining difference between female music theater and classical singing. The result is singing that is an extension of your speaking voice. In simplest terms, female music theater singing requires more use of chest register/Mode 1, especially in the middle register, while classical singing most often uses more head register/Mode 2 throughout the entire vocal range. Even in music theater singing that is influenced by the classical genres, there is more use of chest register/Mode 1 voice production, but not as much as the more contemporary sounds and styles require. An excellent place to begin developing your voice registers is by isolating each of them—a word of caution, however. If your head register/Mode 2 is not clear and easily produced, you need to strengthen it first. You also need to be able to sing in your head register/Mode 2 at a very light volume with ease. I cannot emphasize the importance of this enough! In my experience as a teacher, without exception, the most successful music theater female singers I have taught possessed a very strong head register/Mode 2 technique. Over the years in my teaching, I have observed a pattern in some music theater female singers. Some experienced belters began lessons with me and exhibited a very weak head register. How do I determine this? When I ask them to sing exercises that isolate their head register, I hear a substantial amount of “noise” in their singing. “Noise” is best described as raspy, breathy, lacking in range, and difficult to produce (constricted), especially in the upper passaggio (approximately D5 - E5) and beyond. Remember the voice/vocal folds are a holistic entity. All parts of the voice muscle need to be functionally free, so the type of sound you choose to make is healthy. An unbalanced instrument affects all singing sounds. Make yourself yawn. Notice how the back region of the roof of your mouth lifts and stretches. Yawn with your mouth closed. You will feel your soft palate lift. Pant like a dog. Notice your soft palate lift. Pretend you are startled or surprised by taking a quick breath and pronouncing a silent “ah.” Again, you will feel the soft palate lift. If you have difficulty accessing your head register/Mode 2 singing voice, the most effective vowel to use in these exercises is [u]. Exercise 1. Sing a five-note descending scale beginning on F5. Choose any vowel and sing the first pitch of the descending five-note scale (F5) three times very light and staccato. Descend by half steps down the scale and sing as lightly and staccato as possible. Practice the exercise up and down the scale by half-steps employing all the vowel sounds. Exercise 2. Begin on C4 and sing an ascending staccato octave arpeggio (1, 3, 5, 8, 8, 8, 8, 5, 3, 1) using the [a] vowel. Repeat the upper pitch of the octave three times before descending. Practice the exercise up and down the scale by half-steps using all the vowel sounds. While singing the head register/Mode 2 exercises, monitor the following characteristics in your vocal production. As part of her Somatic Voicework,™ master teacher Jeannette LoVetri developed these guidelines. The vowels best suited to developing head register are [i] ee and [u] oo. Volume is soft to moderate. Vocalize on medium high pitches; avoid extreme high range for now. Make sure the tip of your tongue is resting gently behind the lower teeth. Jaw is relaxed, not too open or too closed. Exercise 3. Head Register/Mode 2 Isolation. Sing a 5-note descending scale on the [i] ee vowel, starting on C5. Descend by half-steps and sing as lightly as possible to maintain a head register dominant sound. Often female music theater singers cannot maintain singing in head register/Mode 2 in the C4 – C5 range because they have developed such a strong mix in this part of their voice for music theater songs. If you fall into this category, sing as softly as possible in that part of your range to develop the ability to stay in head register/Mode 2. Doing so will help your voice remain functionally free and capable of singing in head, mix, and chest registers (Modes 1 and 2). Repeat the exercise on the [u] oo vowel. Exercise 4. Five-note Scale Slurs.Using the [i] ee and [u] oo vowels, begin on F4 and remember to keep your voice very light. Slur between the first (do) and fifth (sol) notes of the five-note scale and return to (do) continuing to slur your voice up and down. Practice the exercise ascending and descending by half steps. Exercise 5. Staccato Triads.Starting on middle C (C4) sing 1, 3, 5, 3, 1 (do, mi, so, mi, do) of the five-note scale staccato and very soft. Continue up and then down the scale by half steps. Check to ensure you are engaging your support/balance muscles. You will feel them engage on each note. When I attended Jeannette’s LoVetri’s CCM training program, Somatic Voicework™ The LoVetri Method, at Shenandoah University, one of the many things I learned was the importance of isolating head (Mode 2) and chest (Mode 1) registers in order to create the music theater mix singing sound. In my own teaching, I start out with a very simple approach. It has served my students well. First, as stated above, I isolate their head register (Mode 2) to determine its status. When I determine that it is healthy and functionally free, I have them isolate their chest register (Mode 1) using the very simple exercise below. Once they are able to anchor their voice firmly in chest register (Mode 1), I gradually have them sing higher in Mode 1 register quality, to a pitch level that is comfortable. Over time and with training, their mix (Modes 1 and 2) range expands. I also explain that chest register taken above E flat 4 becomes a mix/belt (Modes 1 and 2) sound. Next, I explain that mix is a softer, more spoken version of chest register (Mode 1). Chest register (Mode 1) is based on their louder “calling” voice and mix singing is based on the lighter speech quality of their own speaking voice. Both, however, are still chest register/Mode 1 dominant. I have them speak the three sounds back to back so they can experience the difference between all three. Lastly, always keep in mind that mix/belt (Modes 1 and 2) singing is achieved by altering vocal fold vibration and vocal tract resonance in combination. Exercise 1. When your head register/Mode 2 is clear and easy to sing at all dynamics, isolate your chest register/Mode 1. Sing and sustain B flat 3 followed by B natural 3 and back to B flat 3 on the /a/ vowel. Sing as loudly as possible in order to isolate your chest register/Mode 1. Chest register/Mode 1 sounds verydifferent from head register/Mode 2. It’s loud, thick, and heavy. Many females often cannot phonate at this pitch level in chest register/Mode 1. If you have difficulty singing in chest register/Mode 1, sing louder. You can also speak those pitches on “ah” as loudly as possible, too. That can help you sing those pitches in chest register/Mode 1. Continue singing the exercise by descending and ascending by half steps as low as you can comfortably sing and no higher than E flat 4. If you have been classically trained, it might take you some time to learn how to isolate your chest register/Mode 1. When you are able to isolate chest/Mode 1 and head register/Mode 2 with functional freedom, you are ready to “mix” the two registers (Modes 1 and 2) together. Exercise 2. Nah, nee, nah, nee, nah. Using a five-note ascending and descending scale, sing the preceding syllables starting on a comfortable pitch below middle C. Ascend by half steps as high as is comfortable and descend to where you began the exercise. Sing the exercise bright, forward, and full-volume. Imagine it is an extension of your calling voice. Exercise 3. “Taxi.” Sing the two syllables of the word “taxi” on E4 followed by A3. Ascend the scale by half steps and keep repeating the exercise. Maintain a bright, forward, and full-volume singing sound. Again, imagine it is an extension of your calling voice. Ascend the scale as high as is comfortable and repeat the exercise descending the scale by half steps. Exercise 4. “Damn Cat.” Sing the two words “Damn Cat” on E4 followed by A3. Ascend the scale by half steps and keep repeating the exercise. Maintain a bright, forward, and full-volume singing sound. Again, imagine it is an extension of your calling voice. Ascend the scale as high as is comfortable and repeat the exercise descending the scale by half steps. Like I have written earlier, music theater singing is most often based on your speaking voice. Your singing voice is reflected in your speech. Most of music theater singing is some form of mix (Modes 1 and 2) singing. The fullest, loudest mix/belt singing is most often sung at the climatic moments of a song or phrase, while a softer, more spoken-quality mix (Modes 1 and 2) is used throughout the remainder of a song. We speak on pitch and at varying dynamic levels. Developing an awareness of your speaking habits is very useful in music theater singing. First, speak these phrases at varying dynamic and pitch levels. Now sing the same phrases starting at a comfortable low pitch below middle C (C4). The first word of each phrase begins on the lower pitch of a five-note scale. The second word or syllable is sung a fifth higher, and the third word or syllable is sung on the lower pitch of a five-note scale. Let your speaking voice lead your singing voice. If you are new to mix singing, I recommend singing at a volume of “mf” to “p,” no louder for now. As you develop your mix, you’ll be able to sing louder with freedom. As you approach A4, you will probably start to notice the need to make a vocal adjustment. In the beginning, I recommend singing the higher pitches from approximately A4 and beyond very softly. It’s even okay to access your head register/Mode 2 on the upper pitch to ascend in range without constriction. Keep allowing your speech to lead your singing. Sing the word “you” on middle C (C4) and sing the word “never” a fifth higher (G) and return to middle C to sing, “do that.” Repeat that pattern going up the scale by half steps in the comfortable part of your range. As you become more comfortable singing in your mix, gradually sing the exercise higher and higher. Remember to vary the dynamic level of your singing, too. Use the same pattern to sing these phrases. Sing this phrase using a five-note descending scale up and down. Begin on a comfortable low pitch and ascend by half steps in the comfortable part of your range. In my teaching, I have found that the female music theater singer most often experiences constriction at approximately the A4 pitch level, especially the inexperienced or beginner singer. To remedy this, I have them sing the upper pitches from A4 and beyond in their head register/Mode 2 singing voice. This helps them begin to increase their mix range without tension. Some term this type of voice production “soprano mix.” Then, I have them adjust their resonance (vocal tract) on the upper head register/Mode 2 pitches to a brighter, more forward, mouth placement. In other words, a more speech-based sung sound. Tracks 11 – 17 are exercises designed to help you learn to adjust the color or resonance in your singing. I also ensure that the volume they use is soft to medium soft at first. Once they are able to sing from A4 and beyond with a brighter, more head register/Mode 2 dominant voice production, I gradually have them increase the volume and the speech aspect of their singing to a level appropriate for the size of their instrument. Over time, their mixed mode register becomes stronger, louder, freer, and higher in range. Sing the word “oh” on middle C, sing “no” an octave higher, sing “you” on the fifth of the scale (G), and sing “don’t” on middle C. In other words, you’ll be singing an octave up, a fifth down, and returning to the tonic (the beginning note of the exercise) of the scales. Repeat using the all the phrases in Exercise 2 above. In exercises 4 – 11, Elisabeth Howard and Howard Austin explain how to negotiate the mix (Modes 1 and 2) register in female and male music theater singing. Another helpful technique to help you develop mix singing is nasality, sometimes also called “twang.” While you don’t want your singing to end up nasal (except for some character voice singing), it can be helpful when learning to mix registers. It also helps you develop the brighter color vocal sound (a vocal tract adjustment) associated with music theater singing. Exercise 4. Nasality Exercises. Use a descending five-note scale (5-4-3-2-1) and sing the syllable “nah,” “nah,” “nah,” “nah” “nah,” as nasal as possible. Exaggerate the nasality to get used to how that feels and sounds. Go up and down the scale by half steps. Exercise 5. Using the same pattern as the preceding exercise, sing the syllables wah, wah, wah, wah, wah, like a child crying or whining. Have fun, be silly! Your voice resonators are your mouth, throat, and nasal cavities, also known as your vocal tract. Your vocal tract is flexible and tube-like in shape. When you sing vowels and consonants, they change the shape of your vocal tract. The changes in shape are what create the various sounds we all make when speaking or singing. You can learn to use your resonators to create a desired singing sound. For instance, if you allow throat resonance to dominate your singing, a “darker” quality emerges. If you allow mouth and nasal resonance to dominate you create a “brighter” singing tone. Elisabeth Howard and Howard Austin have developed an outstanding exercise to help you become familiar with the different colors your singing voice can create. One of the benchmarks of a healthy voice is flexibility. A voice that is functionally free can move quickly and easily. Be sure to practice singing all the vowels individually using the ascending and descending five-note scale. Start slow and increase your speed over time. Onset of pitch is describes how you initiate a sung sound. There are three types of onset: breathy, balanced, and glottal. Breathy onset occurs when you hear air escaping before your voice begins to phonate. The “h” sound is a good example. Balanced phonation occurs when just the right amount of air engages with the vocal folds for a singing sound. It will sound “easy” and “clean.” There is no breathiness or harshness at the onset of pitch. If you sing “ha” followed by “ah,” you will hear a difference in how a singing sound can begin. Glottal onset occurs when the vocal folds and air engagement are not balanced. A glottal onset sounds like a pop or crack at the beginning of singing. Words that begin with vowels are especially vulnerable to glottal onset. You will also feel a pressure behind your vocal folds before you begin to sing. If you take a large breath and hold it, you can feel this pressure. Balanced onset is your goal in functional singing. Of course, some styles favor breathy onset and singing. In those cases, again, you want to make sure it is something to can add or take away at will. Exercise 1. Breathy Onset - Pick any pitch in the comfortable part of your range and sing it three times staccato. First, use “ha” to experience breathy onset. Repeat going up and down the scale by half steps in the comfortable part of your range. Exercise 2. Balanced Onset - Sing “ah” making sure that the flow of air and vocal fold movement or vibration happens at the same time. Exercise 3. Glottal Onset - Sing the same exercise on “ah,” but purposely create a sharp, hard, popping beginning to the pitch. The tongue can be a source of significant tension, and most singers are unaware of that tension. For the most part, the tip of your tongue needs to gently rest against the lower front teeth. The other parts of your tongue will move differently depending on what consonant and/or vowel is being sung. The best way to determine if your tongue is constricted is by developing an awareness of your swallowing muscles. Place the tip of your thumb one to two inches underneath your chin and swallow. You will feel the swallowing muscles pushing on the tip of your thumb. If those same muscles engage while you sing, you are most likely experiencing tongue tension. In a comfortable part of your singing range, sing any or all vowels on a single tone. Keep your thumb positioned under your chin. If you feel those same muscles engage while you sing, work to release them. You can let the tip of your tongue lift over the edge of your lower teeth to help you learn to disengage the swallowing muscles. Of course, when you sing, your tongue needs to remain inside your mouth. You can also stretch your tongue out as far as possible to aid in the release of the swallowing muscles. Keep in mind that other parts of your tongue will move and change shape in order to sing all the shapes that various vowels and consonants require. Singing requires a more active use of your mouth, jaw, and lips than speech. I tell my students that consonants need to be sung rapidly, clearly, and as quickly as possible. Consonants also require articulation that is more exaggerated than speech. Consonants that are pronounced rapidly, clearly, quickly, and in an exaggerated fashion mean that your mouth, jaw, and lips are more energetically engaged than in speech. When you sing, you are producing a vowel sound. For example, try singing a “d” or a “p” sound. There are, however, a few consonants that allow a sung sound—“m’s,” and “n’s,” for example, but, for the most part, when you sing, you are singing one of the vowel sounds. Consequently, it’s also important to recognize that vowels occupy three major positions in your vocal tract: front, mid, and back. The vowels associated with these positions are called front vowels, mid vowels, and back vowels. Since music theater singing tends toward a brighter vocal color, the front and mid vowels, because of their more forward position in the vocal tract, make it easier to produce the brighter music theater singing sound. The back vowels are more challenging since their back placement naturally creates a darker color. Now practice singing all the vowels in succession on a single, comfortable pitch aiming for a consistent and forward bright color. Let the /ee/ vowel lead the way for other vowel placements and colors. Learning to sing is a multi-faceted endeavor that takes practice, time, and patience. In order to bring together all the aspects of voice technique I have introduced, you need to start with the basic exercises, build them over time, and add others when the basics become more habitual. Of course, working with an experienced CCM teacher and coach is ideal, but I hope these exercises can help you get started or add to your current knowledge. Lastly, I frequently remind my students that no matter how much we learn about the voice, at its core singing remains a mystery. We can only approach it never conquer it. That keeps me humble and always learning. I hope you will do the same. If you would like to make comments or ask me questions about music theater singing, please feel free to email me at songwerks@karenshall.com. I welcome your input and questions.